Keynote Address on “Lessons from America’s Continuing Misadventures in the Middle East” by Ambassador (Ret.) 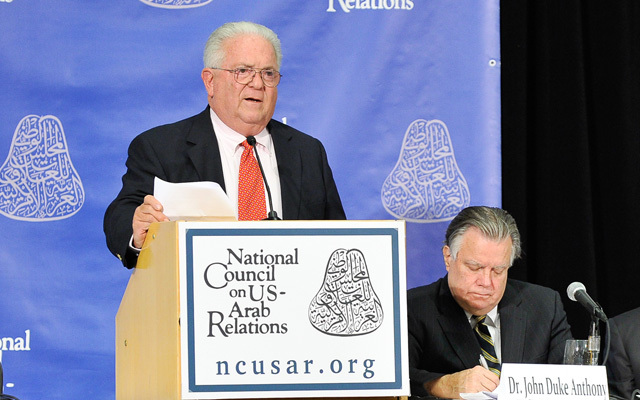 Chas Freeman, Jr., delivered at the National Council on U.S.-Arab Relations’ 24th Annual Arab-US Policymakers’ Conference, “U.S.-Arab Relations at a Crossroads: What Paths Forward?,” on October 14, 2015, in Washington, DC. The National Council on U.S.-Arab Relations’ 23rd Annual Arab U.S.-Policymakers Conference included a presentation on “The Collapse of Order in the Middle East” by Ambassador (Ret.) Chas Freeman, Jr.
An audio and video recording of the speech as well as a link to the transcript are available below. Videos of the entire 2014 conference are available on YouTube and podcasts of the conference are available through iTunes and FeedBurner. Ambassador Chas Freeman – Chairman of the Board, Projects International, Inc., a Washington, D.C.-based development firm specializing in international joint ventures, acquisitions, and other business operations for its American and foreign clients; former President, Middle East Policy Council; former Assistant Secretary of Defense for International Security Affairs (1993-94), earning the Department of Defense’s highest public service awards for his roles in designing a NATO-centered post-Cold War security system and in reestablishing defense and military relations with China; former U.S. Ambassador to Saudi Arabia (during operations Desert Shield and Desert Storm); Principal Deputy Assistant Secretary of State for African Affairs during the U.S. mediation of Namibian independence from South Africa and Cuban troop withdrawal from Angola; and author, Interesting Times: China, America, and the Shifting Balance of Prestige; America’s Misadventures in the Middle East; The Diplomat’s Dictionary (Revised Edition); and Arts of Power: Statecraft and Diplomacy. Ambassador (Ret.) Chas Freeman – Chairman of the Board, Projects International, Inc., a Washington, D.C.−based development firm specializing in international joint ventures, acquisitions, and other business operations for its American and foreign clients; former President, Middle East Policy Council; former Assistant Secretary of Defense for International Security Affairs (1993-94), earning the Department of Defense’s highest public service awards for his roles in designing a NATO-centered post-Cold War security system and in reestablishing defense and military relations with China; former U.S. Ambassador to Saudi Arabia (during operations Desert Shield and Desert Storm); Principal Deputy Assistant Secretary of State for African Affairs during the U.S. mediation of Namibian independence from South Africa and Cuban troop withdrawal from Angola; and author, America’s Misadventures in the Middle East as well as The Diplomat’s Dictionary (Revised Edition) and Arts of Power: Statecraft and Diplomacy. Ambassador Chas W. Freeman, Jr. – Chairman of the Board, Projects International, Inc., a Washington, D.C.−based development firm specializing in international joint ventures, acquisitions, and other business operations for its American and foreign clients; former President, Middle East Policy Council; former Assistant Secretary of Defense for International Security Affairs (1993-94), earning the Department of Defense’s highest public service awards for his roles in designing a NATO-centered post-Cold War security system and in reestablishing defense and military relations with China; former U.S. Ambassador to Saudi Arabia (during operations Desert Shield and Desert Storm); Principal Deputy Assistant Secretary of State for African Affairs during the U.S. mediation of Namibian independence from South Africa and Cuban troop withdrawal from Angola; and author of the newly published America’s Misadventures in the Middle East as well as The Diplomat’s Dictionary (Revised Edition) and Arts of Power: Statecraft and Diplomacy. Ambassador Chas W. Freeman, Jr. – Chairman of the Board, Projects International, Inc., a Washington, DC-based development firm specializing in international joint ventures, acquisitions, and other business operations for its American and foreign clients; former President, Middle East Policy Council; former Assistant Secretary of Defense for International Security Affairs (1993-94), earning the Department of Defense’s highest public service awards for his roles in designing a NATO-centered post-Cold War security system and in reestablishing defense and military relations with China; former U.S. Ambassador to Saudi Arabia (during Operations Desert Shield and Desert Storm); Principal Deputy Assistant Secretary of State for African Affairs during the U.S. mediation of Namibian independence from South Africa and Cuban troop withdrawal from Angola; and author of the newly published America’s Misadventures in the Middle East as well as The Diplomat’s Dictionary (Revised Edition) and Arts of Power: Statecraft and Diplomacy. Arab-U.S. Relations: The Way Forward – 2009 Arab-U.S. Policymakers Conference from NCUSAR on Vimeo. Speaker: The Hon. Charles W. (“Chas”) Freeman, Jr. − Chairman of the Board, Projects International, Inc., a Washington, DC-based business development firm specializing in international joint ventures, acquisitions, and other business operations for its American and foreign clients; former President, Middle East Policy Council; former Assistant Secretary of Defense for International Security Affairs (1993-94), earning the Department of Defense’s highest public service awards for his roles in designing a NATO-centered post-Cold War European security system and in reestablishing defense and military relations with China; former U. S. Ambassador to Saudi Arabia (during Operations Desert Shield and Desert Storm); Principal Deputy Assistant Secretary of State for African Affairs during the U.S. mediation of Namibian independence from South Africa and Cuban troop withdrawal from Angola; and author of The Diplomat’s Dictionary (Revised Edition) and Arts of Power: Statecraft and Diplomacy. Speaker: Ambassador Chas. W. Freeman, Jr. − President, Middle East Policy Council; former Assistant Secretary of Defense for International Security Affairs (1993-94), earning the highest public service awards of the Department of Defense for his roles in designing a NATO-centered post-Cold War European security system and in reestablishing defense and military relations with China. He also served as U. S. Ambassador to Saudi Arabia (during Operations Desert Shield and Desert Storm) and Principal Deputy Assistant Secretary of State for African Affairs during the U.S. mediation of Namibian independence South Africa and Cuban troop withdrawal Angola. Remarks by: H.E. Ali Suleiman Aujali – Chargé d’Affaires, People’s Bureau of the Great Socialist Libyan Arab Jamahiriya; former Chargé d’Affaires Libyan People’s Bureau in Ottawa, Canada; former Libyan ambassador to Malaysia, Argentina, and Brazil. Wall Street Journal Supplement on Saudi Arabia (.pdf file). Featuring articles from John Duke Anthony, Prince Abdullah bin Faisal bin Turki al-Saud, Richard Morgan, Richard Curtiss, Richard Murphy, Chas Freeman, and John R. Thomson. This appeared in the Wall Street Journal on Tuesday, July 2, 1991.